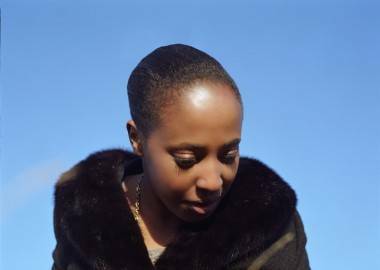 Cold Specks aka Al Spx plays St. James Hall in Vancouver Nov 21. It is only fitting that the newest video from Cold Specks was released on Halloween. The creepy video for the Canadian singer-songwriter’s single “Hector”, directed by Olivier Groulx, shows a pregnant Cold Specks, aka Al Spx, lugging a decapitated man down a dirt road and into a forest, all while she is dressed in a white wedding gown matching her cold, pupil-less white eyes. The possessed and emotionless actions of Specks, paired with the muted colors of the gloomy outdoor scene, create a perfect ambience for the haunting song. The “Hector” video is the third collaboration between Specks and Groulx. They previously worked on videos for the singles “Blank Maps” and “Holland”, both off of her debut album, I Predict a Graceful Expulsion. In an interview with CBC, Groulx explained the inspiration behind the video stating, “The song is about repression and a possessed pregnant bride fit somehow, at least to me and Al. We initially talked about the naturalistic yet weird vibe of early Cronenberg films and used that as a starting point for the video.” Groulx has made similarly spooky videos for the likes of Timber Timbre and Arcade Fire. Cold Specks is a native of Etobicoke, Ontario but is currently residing in London England. Her debut album, I Predict a Graceful Expulsion, was released through Arts & Crafts in Canada and Mute Records worldwide in May of 2012. The critically acclaimed record was shortlisted for the 2012 Polaris Music Prize, eventually falling short to Feist’s Metals. Spx has described her own sound as “doom soul”, which perfectly sums up the dark and gothic tone of her music. The influence of singers from the deep south is evident, and she has also cited American R ‘n’ B singer James Carr and Tom Waits as influences among many others. Specks is currently on a North American tour in support of her debut album. She plays St. James Hall in Vancouver Nov 21. This entry was posted in the latest, videos and tagged Cold Specks, Feist, St. James Hall, Vancouver shows. Bookmark the permalink.